The Flushing Volt Station is an electric vehicle charging station I designed to exist in Flushing, NY. I chose Flushing to be the location for reasons of practicality, experience, and mission. It is a practical location because it is situated right at the nexus of many major highways and bridges of the NY Metro area, effectively making it accessible for millions of metro area residents. Flushing is also a growing community of East Asian immigrants, and the neighborhood reflects that. Indeed, Flushing may appear very foreign to most assimilated Americans. By drawing electric vehicles owners into this foreign-seeming neighborhood, we heighten the exoticness and excitement of the electric vehicle ownership experience. The greater mission of the Volt Station is to create an access point for assimilated Americans to experience the beauty of Chinese and Taiwanese culture thriving in Flushing. It also allows new East Asian arrivals to open up their community and lives to assimilated Americans, easing their transition into their new home, and aiding them in their journey towards achieving the American Dream. The architecture of the Volt Station has a futuristic look to heighten the exotic nature of electric vehicles. It is also designed to be clean and simple, to contrast with the busy, overpopulated, and polluted backdrop of Flushing. This oasis of clean design in a hectic neighborhood was inspired on the Taoist philosophy of the Yin and the Yang, a balance of sorts that serves both sides. This Taoist bent is an element that permeates every aspect of the Flushing Volt Station brand. The glass kiosk at the front of the station operates as a take-out counter for spicy, mouth-numbing Sichuan street food. 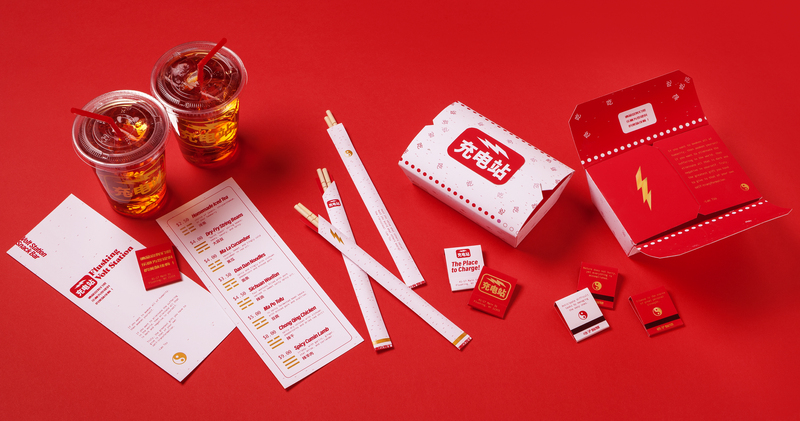 The branding on the menu, chopsticks, food containers and matchbooks combine feelings of futurist intrigue with tasty morsels of Taoist philosophy and symbology. The user experience of the Flushing Volt Station is guided by our app. The primary function of the app is to keep the user updated on the status of the charge, as it can take up to an hour. The secondary function of the app is to keep the user entertained while the car charges up, with a focus on getting the user to interact with the surrounding community. This works as an extension of our brand's values of exploration and integration. As soon as the user pulls up to the Flushing Volt Station, a valet takes the wheel and attaches the vehicle to an electric charger. Once the car is plugged in, the user receives a notification that their car is ready to commence charge. The user reviews how long it will take, what the total cost will be, and how many reward points, or Volt Yuan, they will earn. Once they confirm and "start charge," the user can now explore the app and use it to entertain themselves in a variety of ways while their charge completes. The first screen, "My Charge," shows details of the charging status and offers Daoist quotes the user can swipe through for inspiration. This is the base level of entertainment that the app offers. You'll see that a reward of 800 Volt Yuan has been added to the next screen: "Your Wallet." This screen displays all the items you have bought with your earned Volt Yuan. These items can be pulled up from this screen and used at any time: just tap an icon in your wallet, and a new screen flies up with a QR code that can be scanned at participating businesses in the area. Your Volt Yuan can be spent on the "Market" screen. Once an item is bought, it is added to your wallet for future use in the community. This reward-currency system provides traffic for local business in Flushing, and gives the user real incentive to further explore the neighborhood. The last function, and deepest level of entertainment and exploration provided by the app, is our "Tao Hunt." This is an augmented reality game that uses a map and Taoist clues to lead the user through the neighborhood looking for hidden Ying Yangs that allow the user to claim even more Volt Yuan to spend at local businesses.